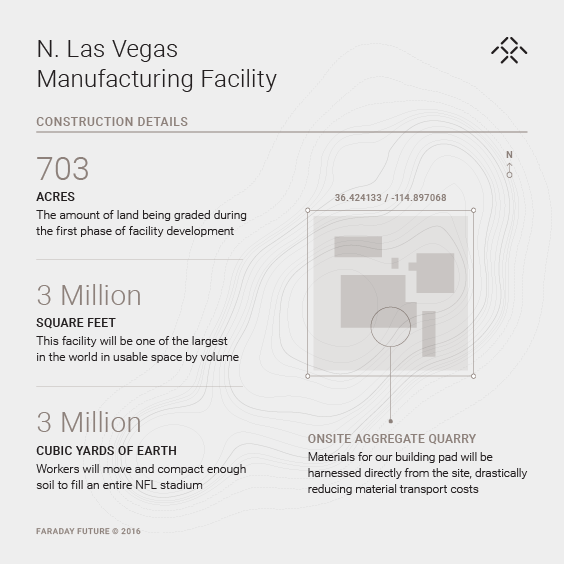 In order to convince Faraday Future to build its $1 billion electric vehicle factory in Nevada, the state gave the startup an incentive package worth $215 million in tax credits and abatements, and $120 million in infrastructure improvements at the industrial park where the project is underway. The Governor’s Office of Economic Development (GOED) is keeping an eye on the project since FF needs to keep up its investment and hiring in order to get the incentives. Today, the GOED released its first report on FF’s progress, which it judges to be satisfactory. Construction work, starting with grading, only started in North Las Vegas this quarter and the report is for the second quarter, therefore FF has no employee in Nevada listed in the report, which is embedded below, but that should change in the next report. According to the GOED report, Faraday Future invested $6 million for the infrastructure design work on the factory. FF believes that upon completion, it EV factory will be amongst the 10 largest buildings in the world in usable space by volume. The automaker is expected to unveil its first vehicle aimed at production by the end of the year. A prototype was recently spotted.